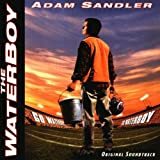 Accueil Produits Bande originale La bande originale de “Waterboy”. La bande originale de “Waterboy”. Sortie : 3 novembre 1998. Born On The Bayou – 5:15. More Today Than Yesterday – 3:22. Always On The Run – 3:53. Doin’ My Thang – 4:10. New Year’s Eve – 4:01. No One To Run With – 6:00.